After announcing it back in September, and rolling out an initial test with selected users last month, Twitter is now bringing it’s new ‘Sparkle’ button to all users, which will enable everyone to easily opt out of the algorithm-defined feed and see the most recent tweets from those they follow first. As demonstrated here, the new button will be present in the top right of the app, where the tweet compose button used to be. When you tap on it, your timeline will switch to show the latest tweets, as opposed to those the algorithm defines as the most likely to be of interest. Tap it again, and you’ll go back to “Top tweets” – the algorithm-determined feed. The option will begin rolling out to iOS users from today, with Android and web to follow soon. Twitter’s algorithm has long been a cause of frustration for users, with some arguing from its initial implementation back in 2016 that an algorithm ranking of tweets runs totally in counter to what Twitter is all about – i.e. highlighting the latest news and updates in real time. Of course, there have always been ways to switch off the algorithm, or at least reduce its impact, but it required users to manually untick a box within their account settings, and/or provide feedback to Twitter that they ‘don’t like this’ on specific, unwanted intrusions in their timeline. Many users refused to do this, hence, Twitter’s new, simple, prominent ‘Sparkle’ button, right in the main timeline. But there is a catch – or at least, an additional consideration that’s now been added into the mix. Now that everyone is getting the ‘Sparkle’ switch, the ‘Show me the best tweets first’ setting (shown above) is being retired, as it’s no longer necessary. That makes sense – now that you can effectively do the same thing within the main feed, you don’t need to go into your settings and switch it off. But take note of this explanation at the bottom of the new switch option. Twitter’s being slightly tricky here – they’ve named these two new feed options separately: ‘Home’, which is your now normal, algorithm-defined feed, and ‘Latest Tweets’, which has no algorithm influence. When you tap on the icon, you switch to ‘Latest Tweets’, but it will revert back to ‘Home’ – the algorithm-defined feed – after a period of time. That means that if you want to get rid of the algorithm entirely, which you used to be able to opt out of in your settings, you now have to manually tap this button every time you use the app. 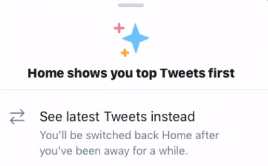 It’s worded in a way that hides this a little bit – rather than specifically noting that you’ll be switched back to the algorithm, it says you’ll be switched back to ‘Home’, which doesn’t sound the same. That could ensure Twitter gets both the PR benefit of providing a simple algorithm switch, while also retaining much of the algorithm’s benefits. 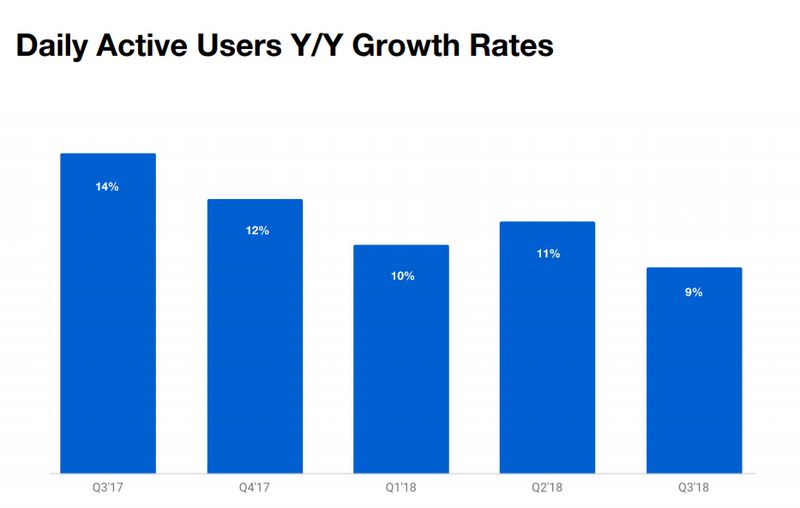 As Twitter has noted in its regular performance reports, the algorithm-defined feed, despite user protests, has actually helped the platform consistently boost engagement since implementation. It’s understandable, then, that Twitter would prefer users stay with the algorithm-defined ‘Top Tweets’ feed, as it is more engaging – but Twitter also wants to appease users who feel like they’re getting a lesser experience because they’re not seeing everything in order. Maybe, by simply providing an option to switch, that will placate users – given the wording, some will likely think they’ve made a permanent switch, when they haven’t, and Twitter will continue to benefit from the algorithm while user angst over the same will decrease. Either way, Twitter is providing the option – the discussion over the impact of the algorithm will now largely be negated because all users will be able to quickly and easily make the switch, whenever they like. Sure, you may have to do it every time you log in, but you can do it, whenever you want. No need to complain about it anymore. Now Twitter just has to roll out an edit button and all of its most common UI complaints will be addressed.